Haunted locations for added spine-chilling interest to your trip. We do ghosts rather well. Pipers, dogs, green ladies and more - in castles, mountain tops, an airfield at Montrose and even a museum in Fort William. With all those ruined castles, bare moors, lonely cottages and dark woods, you’re never far from haunted locations in Scotland. Here is a selection of some of my favourite stories about silent spooks and noisy banshees, a word which just happens to be Gaelic for ‘white fairy’ (or near enough). This page covers the whole of spooky Scotland and is a big read, so let’s go ghost hunting. I grew up with this story. Basically, it was a straightforward case. Daughter falls in love unsuitably. Father locks her in tower and bumps off daughter's lover. (Hey, it happens in folklore a lot.) Daughter kills herself in grief. In this instance, Sir Alexander Fraser’s daughter Isobel jumps from the ancient Wine Tower adjacent to Kinnaird Head Castle (pictured) in Fraserburgh - the east coast fishing town where I was born and raised. The cave below the Wine Tower was the original scene of crime, though, to be honest, I never found the cave. The ghostly lover in there still plays his pipes on stormy nights. The photo shows the Wine Tower on the edge of the cliff. The cave must be under water! 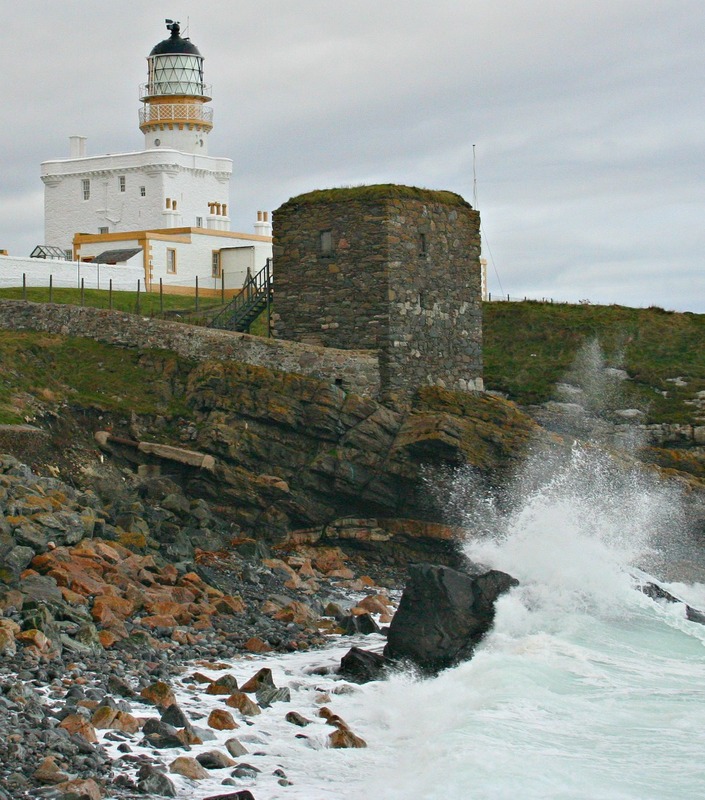 Easy to find in Fraserburgh – follow signs for Museum of Scottish Lighthouses. Builders always being scarce in the north-west, a Macleod chief had to do a deal with the Devil to get Ardvreck Castle built. He offered his daughter in marriage to Auld Nick – the Devil himself. She only found out after they were wed and flung herself from the tower. Her ghost is heard weeping bitterly here to this day. (And this is close to my own nominated paranormal spot. Coincidence? Well, of course it is……) Located off A837, NW of Inchnadamph. Wartime aerodromes, where so many young men left the ground and never returned to it, are often strange and atmospheric places. Montrose aerodrome was haunted by the ghost of an Irishman whose World War I biplane had a botched repair and broke up in flight. He had no parachute. Other later hauntings have also been reported. Paranormal investigators here have photographed ‘orbs of light’. Errr, guys, these were probably just reflections from the photo-flash off shiny surfaces. The Montrose Air Station Heritage Centre is at Waldron Road, Montrose, Angus. Quite well known in the league table of haunted locations, this formerly was Scotland’s most haunted youth hostel, with a long record of ghost appearances. These include phantom pipe music and organ music, also a lady in white and an apparition carrying a sword. The old Nursery or Schoolroom is the most haunted part, with a long list of unsettling goings-on. (They must have had plenty to talk about in this hostel common room in the evenings – though at time of writing the hostel is closed and there are plans to turn the castle into a luxury hotel.) Located by Culrain, Sutherland. If you seek out places with a reputation for unexplained sightings, then this is the one that needs the most effort to visit on foot. It’s an all-day high level excursion. The Big Grey Man of Ben Macdhui (An Fear Liath Mor) – a modern day giant – most famously made his presence felt to Professor Norman Collie, an eminent scientist, in 1891. He (the professor) became so spooked by being followed by something which was taking one crunching step in the snow for every three he took, that he panicked and ran for four miles down to the lower ground at Rothiemurchus. This is one of my favourite ghosts in Scotland. The variation in the story is the climbers who, in poor weather and in the distance, see a figure approach the summit cairn (stone marker), walk round it and then disappear. They note he is the same height as the cairn. When they, shortly after, reach the summit they find the cairn is (gasp!) 10ft (almost two metres) high. The only problem here is the last time I was at the Ben Macdhui summit, the cairn was the same height as me. Hmmm. Anyway, pictured is a photograph of the plateau area of the Cairngorms, with Ben Macdhui just off the right hand end of the panorama. A grey place for a grey man, I suppose. Finally, among the many Big Grey Man stories, there is also the tale of the naturalist who was ferreting around the summit area in 1943 when he encountered a looming shape that so unnerved him that he fired his revolver at ‘the thing’. I love the thought of an armed nature lover wandering around the Scottish summits. Still, it was wartime. Located 8 miles (13km) south-east of Aviemore. A dark-haired Highlander in Stewart tartan has been seen on one of the grave mounds. Basically, if you are going to see ghosts anywhere in Scotland, then it’ll be here. Follow the link here for the story of Culloden Battlefield. Located 7m / 11.5 km E of Inverness. A former curator, Edith MacGregor, exemplifies the dedication of her calling and has been heard typing away in one of the rooms upstairs. This is unsettling for the other staff as she died back in the 1960s. No typewriters can be found in the building; all have been replaced by PCs and laptops. The West Highland Museum, Cameron Square, Fort William. I have to say that this is one of my favourite haunted location. If you want tons more of this kind of thing, then there's a good selection of books about Scottish ghosts on that Amazon link. Leaving no footprints as he crosses the sand (well, he wouldn’t, would he? ), a bearded sailor has been reported, down to the detail of the large brass buttons on his jacket. Other phenomena have centred on the old bothy near the shore, not recommended for overnight accommodation. A red-headed mermaid is also associated with this wild and lonely spot – it's altogether atmospheric and used to be seldom visited, but this has changed in recent years, as tourism marketing efforts seek out remote spots to ruin. At least it’s still a big walk. Access on foot north of Kinlochbervie. I love this one. In the 1920s and again in the early 1960s different members of the same local family, using the railway as a short cut in dead of night, encountered a phantom steam train complete with brightly lit but empty carriages and no-one in the locomotive cab. It appeared to be floating above the track. There is now no railway at this spot, but Dava Moor’s lonely ambience certainly fires the imagination. I’m sure it’s close to where Macbeth met the witches as well. South of Dunphail, between Grantown-on-Spey and Forres. The main road by Sligachan on the Isle of Skye has been the setting for the spectral appearance of a 1934 Austin. According to witnesses, the vehicle is seen being driven at high speed (and no doubt fuelled by high quality motor spirits), causing the said witnesses to pull over to let this car overtake them as it approaches rapidly from behind. Then it vanishes. (Come to think of it, that could just be because it is going so fast. Maybe it’s a real car…..you know what these island locals can be like.) Sligachan – on the A850 – Isle of Skye. Delgatie Castle is reputed to be haunted by a red-haired woman. Apparently, during World War II, her apparition was disturbing enough to cause an entire detachment of troops who were billeted there to flee in their bare feet in a collective panic from the castle. Fyvie, dating from the 13th century, has multiple hauntings. These include the ghost of Andrew Lammie, a trumpeter and unsuitable suitor for the Laird’s daughter. He was accordingly banished, but swore the sound of his trumpet would foretell the death of every laird of Fyvie. He turns up from time to time in rich tartan. Another castle with five stars for hauntings. The Grey Lady of Glamis hangs around as she was accused of witchcraft and burned at the stake. The Monster of Glamis is a sinister story about a family member never allowed out of the castle. This is Edinburgh’s centre for ghostly tourism and a clever use of a series of dusty ancient rooms and passageways below later buildings, formerly used as storage space by the local council. To me, utterly unconvincing, but it gives employment to a whole host of spectres below present-day ground level of the Royal Mile. For example, visitors on their guided tours of the Close are reverently shown the gifts left by well-wishers for the ghost of a little girl who lost her dolly and whose presence has been felt by various 21st-century mystics. Distinctly weird and (unfathomably) popular, but an important part of the haunted Scotland image. Off High Street, in the Old Town of Edinburgh. Another hotspot (or coldspot) for spooks. A poltergeist attacks sightseers, and tourists on local ‘ghost walks’ have been roughly handled in a variety of ways. Definitely in the haunted Scotland top ten. Notoriously associated as a Covenanters’ prison, where many died. Some say the presence is that of George ‘Bloody’ Mackenzie, former Lord Advocate, who imprisoned the Covenanters. By George IV Bridge. Take your pick from a headless drummer (sighted in 1960) or even a ghostly piper on the battlements even when the famous Military Tattoo isn’t on. Then make your way to the Vaults, where workmen were disturbed by prisoners left over from the Napoleonic Wars. This theatre is said to be haunted by a ghost called Albert, said to be friendly but mischievous. It is believed that Albert is the ghost of a maintenance man killed in a backstage accident. It’s always nice to put a name to your phantom. 18-22 Greenside Place, Edinburgh. He was executed for witchcraft in 1670. For years afterwards, his apparition flitted around the street, or galloped off at dead of night on a headless black horse. Located at the Grassmarket end of Victoria Street. Phantom monks put in intermittent appearances in and around the site. These include a monk praying at an altar in the crypt, with four knights in attendance. The ghost of the apprentice who carved the famous Apprentice Pillar and who was said to have been murdered by his teacher has also turned up. Strange lights and fire around the chapel are supposed to herald deaths in the Sinclair family – at least, Sir Walter Scott thought so. Rosslyn Chapel, 6 miles / 10km south of Edinburgh, in the village of Roslin. Family home of the Dalyells, most famously 17th-century military man Sir Tam Dalyell, whose apparition rides a white horse up to the house. Tam is said to have played cards with the Devil and won. The Devil was furious and threw the card table at Tam. It missed, crashed through a window and landed in a pond, where it was found in 1885. (So it must be true.) Located 3 miles / 5km east of Linlithgow. Sir Walter Scott, the famous Scottish writer and historian, created Abbotsford in his own lifetime, filling it with artefacts of Scottish history. His ghost is said to haunt the dining room, where he died in 1832. Another presence, it is said, is that of the spirit of George Bullock, who died in 1818 and was in charge of the rebuilding of Abbotsford. Located 2 miles / 3 km from Melrose. In Fife, Falkland Palace was a favourite hunting lodge (should that be haunting lodge?) of the Stuart monarchs. Its fine Renaissance work is said to be frequented by a ‘White lady’. She stands at a window in the Tapestry Gallery, weeping as she watches her departing lover, who has been – inevitably in such cases – banished forever. Worth a visit for the gardens (pictured). Located in the village of Falkland, 11 miles / 17km N of Kirkcaldy, Fife. The remains of a Cistercian monastery founded in 1217. A secret tunnel at the abbey was said to lead to a room full of gold, looked after by an old man who waited in a golden chair to hand over the wealth to the lucky (?) finder. A piper and his dog were once sent in to investigate the tunnel – a short time later, the dog came out terrified. The piper was never seen again. Piper and dog in cave a fairly common theme in Scottish ghost tales. In the village of Culross off the A985. The Royal Research Ship Discovery is said to be haunted. Footsteps and other disturbances have been heard. Some think it could be the ghost of Ernest Shackleton; or Charles Bonner who fell to his death from the crow’s nest in 1901. Discovery Quay, Dundee. After the disastrous fall of the bridge in 1879, stories began to circulate about strange events on the anniversaries of the tragedy, as witnessed by train travellers. A young man joined a north-bound train in Fife and found a compartment empty except for an elderly gentleman dressed in old fashioned clothes. When the train began its crossing over the replacement Tay Bridge, the old man’s features began to contort in fear and pain. (These days that would be explained by his looking closely at the price of the rail ticket.) Then he faded away, leaving the young man alone in the compartment. McManus Galleries have Tay Bridge memorabilia, Albert Square, Dundee. See also picture, in Royal National Museum of Scotland. This is actually one of the broken girders. Pretty impressive, eh? The Rev Robert Kirk, the local minister, was an authority on fairies and often conversed with them on the Doon Hill. He was found dead in his nightshirt there one night in 1692. Afterwards, he appeared in ethereal form, looking for help in escaping from the fairy world. He has now been turned into the tall pine which grows on the hilltop. Signposted near Aberfoyle. Well, that's quite enough, don't you think? Lots more about Scottish ghosts on Amazon though. Culloden Battlefield saw the last battle on Scottish soil. Not Scots v English, but a civil war. Great on-site visitor centre. A Highland must-see. And though it's a designated war grave, no regiment in the British Army has it listed on its battle honours. Visit and you'll find out why.